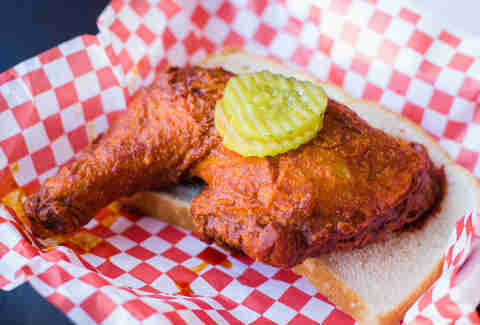 Nashville Hot chicken. It's the bird that bites back. And if you've lived in Nashville for longer than 35 seconds, you've had some (and immediately regretted overestimating your heat tolerance). 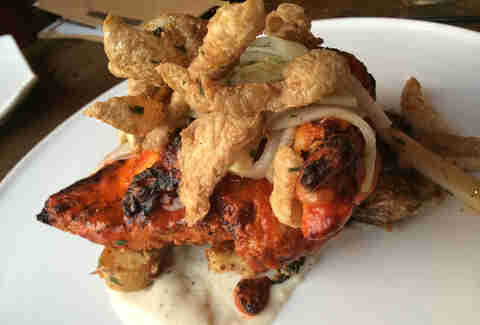 But everyone has a favorite place to get it, whether that be a dedicated hot chicken restaurant, or merely a spot with enough good sense to list it on its menu -- so we decided to test out every spot of even minor significance, and ruthlessly pit them against each other, Hunger Games-style. Downtown Should you want to experience two Nashville staples in one visit (honky tonkin’ and hot chicken), Acme Feed & Seed is your spot. Acme has two different hot chicken dishes on its menu: traditional (on the menu as “Rule the Roost”) and sliders (aka Little Bitty Hot Chicken Bites). Again -- good, but not great. East Nashville & 12South Edley’s, one of our favorite BBQ joints, serves a hot chicken plate that’s pretty decent and only served as part of the lunch menu. The chicken itself is spicy and made rather traditionally but instead of white bread, Edley’s serves its hot chicken with a side of cornbread, jalapeño ranch, and a bit of slaw. But don’t worry, you still get the pickles on the side. 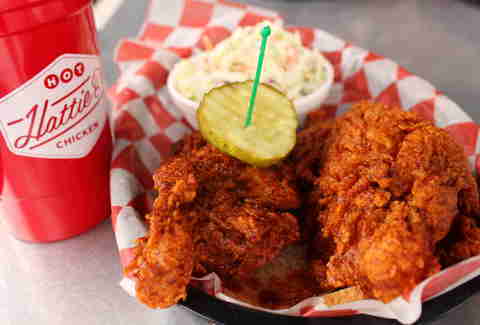 With a great overall menu, Edley’s is a good place to go with friends when you have a mix of hot chicken-lovers and people who simply can’t take the heat. Franklin Not necessarily the best hot chicken in existence, but definitely the best in Franklin. Big Shake’s is the one true exception to the rule of "mild still means some spice." Its “original” chicken and fish is genuinely mild with little to no heat in it. 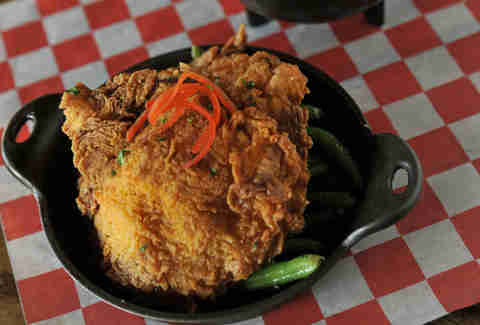 And of course, it has more traditional hot chicken and fish options as well. 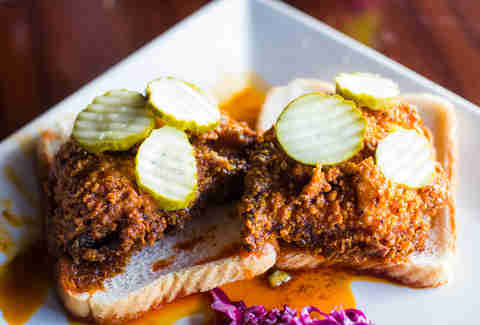 The Gulch At Whiskey Kitchen, the WK hot chicken is one of the chef's specialties, and for good reason. It’s cooked up Southern style in an iron skillet and served with creamy chipotle mac & cheese. It’s not quite as sticky and messy as many other hot chicken dishes but it’s still extra spicy and delicious. 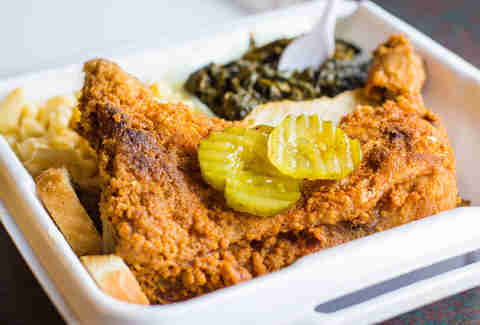 The recipe also has a larger portion of breading compared to many other hot chicken dishes in town but it adds a nice crunch that you expect to find in good fried chicken. The Gulch Rather new to the scene, Party Fowl has some unique hot chicken dishes, from nachos and po-boys, to a "breast & beignet." 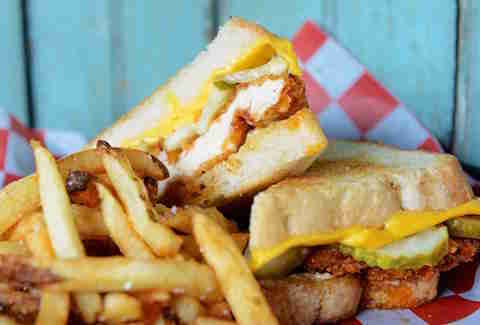 And of course, it serves traditional hot chicken on a bed of white bread and topped with slices of pickle. Your chicken can be ordered with four different heat levels ranging from mild to “Poultrygeist,” and it’s all pretty solid fare. 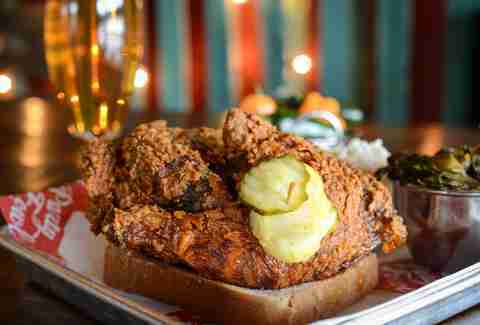 East Nashville Tenn 16 isn’t widely known for its hot chicken -- in fact, when it opened, it didn’t even have it on the menu, because the head chef wanted to make sure that he did the dish justice. He traveled around to all of the best joints in town and tested his own recipe until he perfected it. And we think he did a damn good job. Fresh ginger and white pepper are two special ingredients that make it unique. 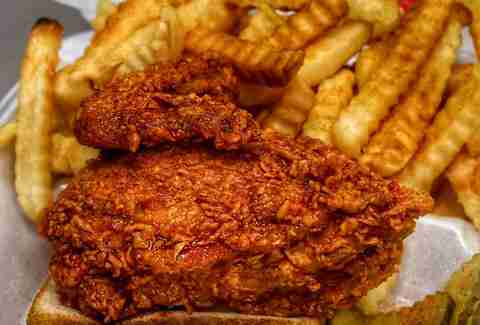 SoBro 400 Degrees Hot Chicken is known for its varying heat levels which range from zero degrees all the way up to (yep, you guessed it) 400. Zero is “plain” which really means that it’s just fried chicken. 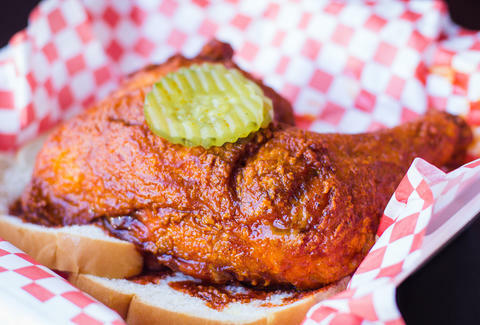 100 is mild... but you know what we’ve told you about “mild” hot chicken. And 400 will literally set your tongue on fire. Jefferson St Helen’s Hot Chicken started out as a food truck in Germantown but has since set up shop about a mile away on Jefferson St. Her chicken has become so popular, that she's since opened up quite a few other spots in the greater Nashville area, and even a location in Texas. The spice levels range from plain to “Hella Hot” which can be ordered on either chicken or fish. And it is delicious. 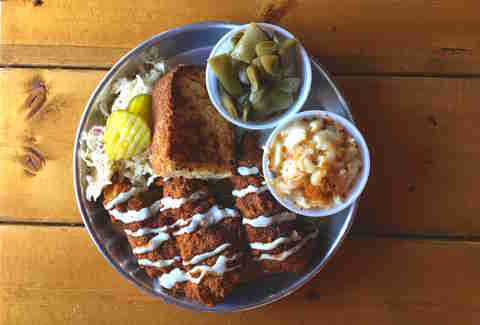 East Nashville & Melrose Bolton’s is a small concrete hole-in-the-wall that serves traditional-style Nashville hot chicken with the addition of fish. Its version is slightly heavier on the breading, which is a good or a bad thing depending on who you ask. Also, this place seems to use more of a purely dry rub as opposed to other hot chicken dishes that are a bit more on the sticky side. We recommend switching things up when going to Bolton’s and trying the hot fish. Please note that it does have a “very mild” option but even that still has a pretty good amount of spice to it. Midtown Beside’s Prince’s, Hattie B’s is probably the most-visited hot chicken joint for tourists, with a rather perpetual line out the door. It's somewhat new to the scene, compared to places like Bolton’s and Prince’s, but it's easily one of the best. The chicken is nicely breaded, the meat is extra juicy, and although it's not quite as spicy as some other places in Nashville, it’s absolutely delicious nonetheless. East Nashville Pepperfire boasts a heat level rivaled by very few. Seriously, its chicken is HOT. 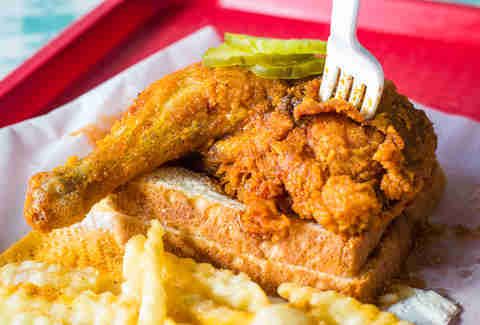 The recipe has a bit less breading than many other places in Nashville, and it works like a charm, bringing out the crispiness of the chicken particularly well. East Nashville As much as we wanted to avoid the cliche, and not put Prince’s at number one, we simply couldn’t avoid it. 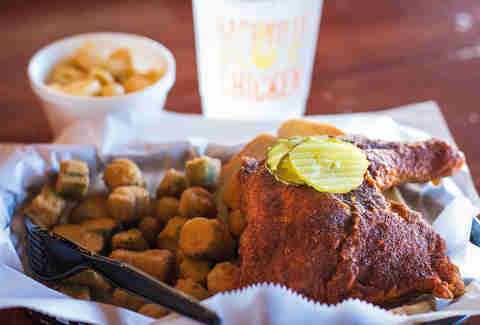 Not only is this place the true originator of hot chicken as we know it today, but it’s also the absolute best in town. The spice levels range from mild (remember, mild doesn’t mean what you think it does in this case) all the way to “XXXHot,” and it’s all served in the most traditional form, on top of two slices of plain white bread with a few pickle slices on top. If you’re smart, you’ll order the fries to go with your chicken, to help tame the heat in between bites. Sign up here for our daily Nashville email and be the first to get all the food/drink/fun the Music City has to offer. Brita Britnell is a Nashville-based food photographer and writer who loves hot chicken even if she does typically order the mild. Follow her at @BBritnell.